You can view Stats for your site via the Stats button on the main page of your account. You can see Pageviews and Unique Visitors from the past 30 days. 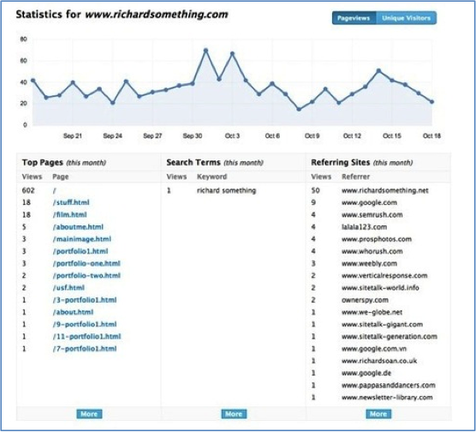 You can also see the most visited pages, search terms that were used to find the site, and the sites which referred the most traffic to your site. Pageviews: The number of pages visitors viewed on a given day. One visitor may visit three, ten, twenty, however many pages. Unique Visitors: The number of individual visitors who came to the site. The unique visitors number should always be smaller than the pageviews number simply because one person can visit multiple pages and thereby generate a number of different pageviews. Referring Sites: If a visitor clicked a link on another site to reach your site then they have been "referred" to your own site by this other site. The more in-bound links you have pointing to your site, the better your search rank will likely end up being. Every website has an address that can be used by anyone who wants to visit that site. But how do people who don't know the address of your site find you? Search Engines! Most people use Google to look for sites, and a smaller number of people use Yahoo or Bing. So you want to get your site listed on these search engines so that your site can be found by the wide audience of potential visitors. Help others find your site by learning The Basics of SEO (Search Engine Optimization).